Water park is open next time Thu-Sun 15.-18.10. Welcome! Please note that 24.8. onwards the water park is closed. Please see the opening hours of the water park. E-ticket purchase: 1 € transaction fee per purchase. The ticket is valid until 23.8.2015. Regarding FunTour ticket, please see the opening hours of Puuhamaa. Payment by a credit card or a Finnish netbank. If your preferred payment method is not shown, select the default method and you can change it afterwards. Please print the ticket or show it from your smartphone in the ticket sales booth. Family ticket is for 2 adults and 2-3 children of ages 4-17 years depending on the ticket category. 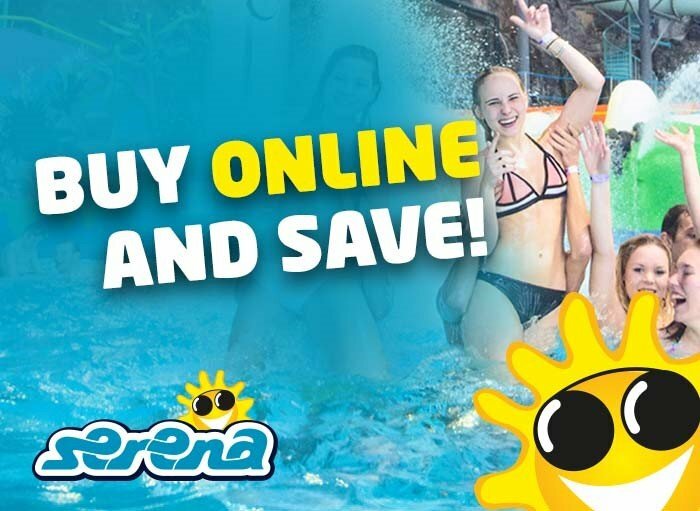 During summer season you must purchase a ticket before entering the outside area of the waterpark. We accept all major credit cards, Smartum-, Virike-, and TYKY- vouchers. TYKY-Online card is accepted but Smartum card is not. Please notice that lockers work with two euro (2 €) coins. The water park pool area closes at 7.45 pm and water park closes at 8.00 pm. Serena gift card is available from Finnair PlusShop! E-ticket purchase: Payment by a credit card or a Finnish netbank. If your preferred payment method is not shown, select the default method and you can change it afterwards. Please print the ticket or show it from your smartphone in the ticket sales booth. During summer season you must purchase a ticket before entering the water park. The water slides and outdoor pools are closed 30 minutes before the park closing time. The indoor pools are closed 15 minutes before the park closing time. The water park closes at 7.00 pm. Children under 6 years wearing a helmet: free of charge to all slopes if accompanied by a guardian with a ski lift ticket. Children under 6 years of age also need a smart card, to which the free ticket is loaded. Children’s rope lift doesn’t require a smart card. Same type of cards are used e.g. in Himos, Sappee, Riihivuori, Saariselkä, Sveitsi, Hirvensalo, Kokonniemi, Åre, Sälen, Vemdalen, Hemsedal, Trysil, etc.ski resorts. We accept most of the SkiData keycards, with certainty the basic cards beginning with ’01’, and most of the “ISO-DUAL” cards beginning with ’30’, as well as “ISO” cards beginning with ’29’. The ISO DUAL eco cards beginning with ’25’ are not accepted. Snow Card cards are not compatible with Axess or SkiData ticketing systems, therefore not accepted in Serena Ski. Sports, culture, virike- and TYKY vouchers. Please write your name in legible handwriting on the reverse side of the voucher. Equipment rental cannot be paid with these. Parking fee is 5 € / day / vehicle or 1 € / h. Vending machines operate with cards, coins and Easy Park mobile app. Season passes include free parking and admission to the water park for the entire ski season.